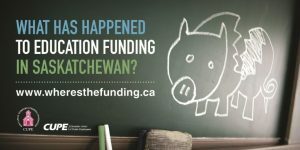 CUPE education workers launch provincial campaign about underfunding in education | Where's the funding? REGINA: CUPE has launched a province-wide campaign to raise awareness of the funding challenges in K-12 education. The campaign is called “Where’s the funding?” and features billboards , a website, and a postcard campaign. ffing levels. Both Saskatchewan Rivers School Division and Good Spirit School Division cut staffing hours. Prairie South School Division laid off over 30 staff, and Prairie Spirit School Division laid off over 60 full time equivalent educational assistants. In addition, other school divisions, like Regina Public School Division, are resorting to other methods to bring in money, such as charging parents for lunchtime supervision. Recently, the Workers’ Compensation Board made the decision to give rebates to all employers in the province who pay into the fund. 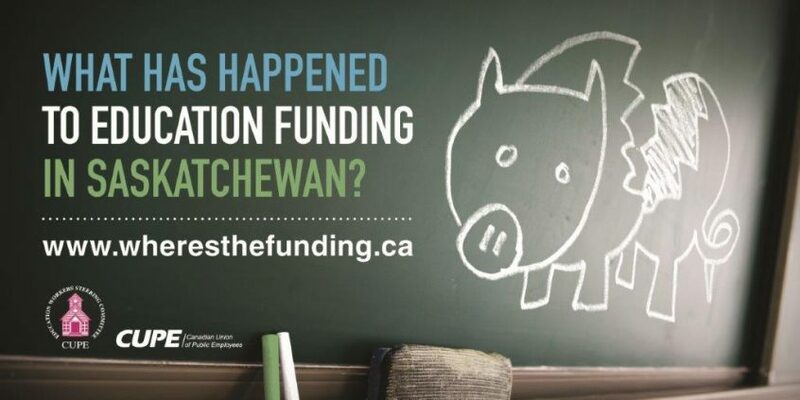 The Government of Saskatchewan responded by clawing back those funds from the provincial operating grants of every school division, even though private schools were able to keep their rebate. The provincial government has also been musing about school board mergers and restructuring, which is creating uncertainty for parents, staff, and school boards. “Our government must invest adequate funding in education to allow school divisions access to the required resources, ensuring all Saskatchewan children’s rights to a quality, safe, and healthy education,” added Christianson.